Access pre-built, ready to use Campaigns in the Marketplace. Some are free and others require contact information or payment to use. Have a Campaign you think will benefit the community? You can share it or sell it. ONTRAPORT will handle the details for you, including collecting and distributing payment to you via PayPal. Navigate to Admin > ONTRAPORT Marketplace and complete the Profile Manager section. The information you add here is shown to users who view your Campaigns. Navigate to Contacts > Campaigns click the + New Campaign button. On the left are categories of pre-built Campaigns you can select. Expand the items such as View by Type to filter the available Campaigns. Select the Campaign you want to use. A confirmation dialog appears and then the Campaign is added to your Campaigns listing. The added Campaign includes all the elements needed, but you will need to configure some elements such as emails and landing pages to match your business. 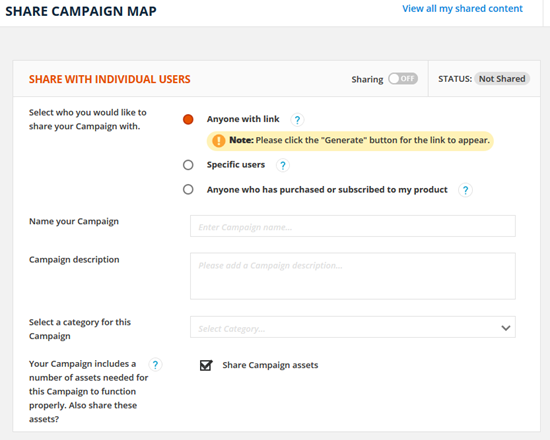 Navigate to Contacts > Campaigns and click the title of the marketplace Campaign you added. In Edit mode, click on the Checklist to see the items you need to configure. The items with red bullet points are Campaign Map elements that must be configured before publishing the Campaign. Click the blue links in these items to complete that element. The Checklist will keep track of your progress, and will prevent you from publishing the Campaign as long as some of those elements remain incomplete. You can add your own items to the Checklist as well, and mark them complete when you have completed them. 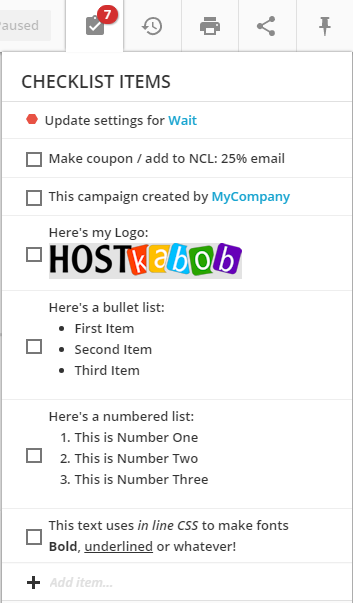 You can use many HTML tags to format your Checklist items. The items you add this way do not prevent you from publishing the Campaign. This is ideal for related tasks that are not part of the actual Campaign Map such as "Advise Webmaster Campaign is Starting". 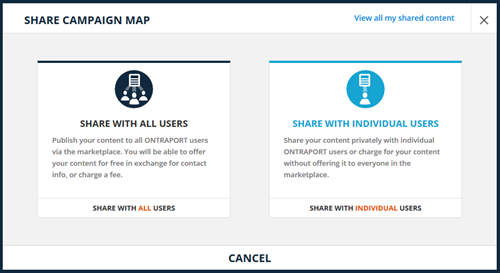 The ONTRAPORT Marketplace allows you to share or sell Campaigns. Marketplace Campaigns can include all the assets in the Campaign such as ONTRApages, ONTRAmail, Tasks, SMS Messages, ONTRAforms and custom fields. There are two options for choosing who you share or sell your Campaigns to and how it gets shared. 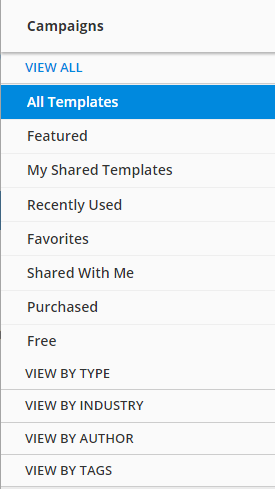 Sharing your Campaign in the Marketplace shows it to all ONTRAPORT clients, and is covered in this section. To share your Campaign without listing it in the Marketplace see the Share a Campaign to Individuals (no Marketplace listing) section below. Make sure that you've completed your marketplace profile. Navigate to Administration > ONTRAPORT Marketplace and complete the Profile Manager section. Once that's done and you've created and saved a Campaign, click the Share icon. Choose how you want to offer your content - free or charge a fee. If you choose charge a fee, enter the price you'd like to charge in US dollars. Note: Choose this option wisely! Checking this box will transfer any messages (emails, SMS, tasks, etc), any ONTRApages, forms of any type (ONTRAforms and Legacy Smart Forms), all images included in those assets, any custom fields that are referenced, nested Campaigns, Legacy Sequences and anything else required to make the Campaign work into the recipient's account. Warning: ONTRApages with custom HTML blocks and ping URL elements are not allowed in the Marketplace. Please omit these from your Marketplace templates. Make sure that you've completed your marketplace profile. Navigate to Administration > ONTRAPORT Marketplace and complete the Profile Manager section. After you have created and saved a Campaign, click the Share icon. Anyone with link - this will generate a link that you can copy and paste into emails, documents, etc. Specific users - enter email addresses of other ONTRAPORT account holders. The email address should be the admin seat for easy installation. If the email address you enter does NOT have an ONTRAPORT account, they will receive an email asking them to start an ONTRAPORT account. Please use the anyone with link option if you're not sure of the email address and want them to get the Campaign. Anyone who has purchased or subscribed to my product - choose whether it's a product or subscription and select the product. An email will be sent to the person in your database who purchased or subscribed to that product letting them know you shared the Campaign template with them. Choose a name for your Campaign that will be shown to the individuals, enter a description and select a category that best fits your Campaign. Once the Campaign is shared, the sharing toggle will be turned on and the status will change to approved. Too view all of your shared content, click the "view all my shared content" link above the sharing toggle. After they click the link your share partner will go to a landing page explaining the content and asking them to log in. 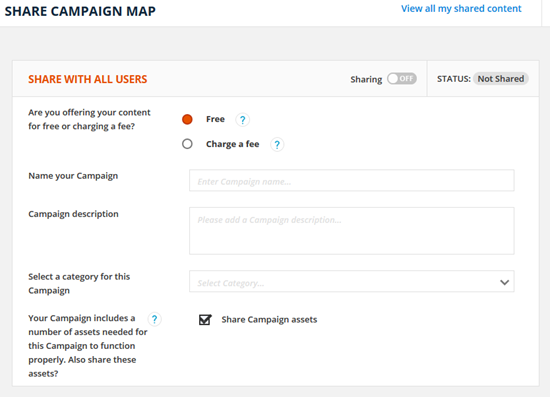 To turn sharing of a Campaign map off, slide the sharing toggle to off. Shared Campaigns will add all the necessary assets, including custom fields in the Contacts database. An exception occurs with large accounts and custom Contact fields due to the longer processing time required during the installation process. The Campaign will still install, and then you can visit Contacts > Settings > Field Editor to add the custom fields at a time that is convenient for you.